This sweet and zesty supper dish is ready to eat in just 30 minutes and makes a great family meal. Heat the oil in a large frying pan. Cut 1 of the lemons into thick slices and add to the pan with the sweet potatoes. Cook over a gentle heat for 15 minutes, turning occasionally, until the potatoes are browned and tender. Add the garlic, chicken and rosemary to the pan, increase the heat and season. Cook for 10 minutes until the chicken is browned and thoroughly cooked, with no pink meat. 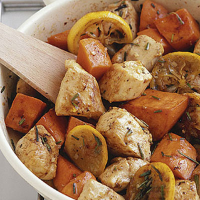 Squeeze the remaining lemon over the sweet potatoes and chicken, and stir in the honey. Simmer for 1-2 minutes, then serve immediately with organic broccoli. After handling raw poultry, wash work surfaces, cutting boards, utensils and hands thoroughly. Creamy Chardonnay has a fresh citrus zestiness which matches this dish's lemon flavours. This recipe was first published in September 2006.